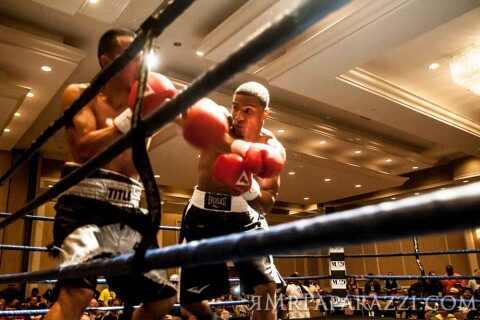 St.Petersburg, Fla.–Clarence “The Truth” Booth (6-1, 4 KO’s) wins by unanimous decision over Juan Aguirre (5-10-1) this past Saturday night at the Hilton Bayfront. Presented by One Punch Boxing in association with MAD Integrity, the main Event action was Booth attacking early. Aguirre looking not sure of himself winging shots not getting set with his punches and Booth jumps on him with hard shots to the body ending round one 10-9. In round two Booth was still controlling the pace of the fight as Aguirre walking in a little wide gets caught with a hard left to the head that causes more problems for him. , Aguirre looking more tired in the round denotes he is losing his legs a bit and loses round 2. In the third round Booth is going right after the slower right handed Aguirre, as Booth stays on his toes picking his shots. Aguirre is fighting back but smothering Booth for air, the crowd at the Grand Bay Ballroom roars as Booth attacks harder in the round getting closer exploiting the one dimensional style of Aguirre. Action in fourth round; Booth filled in the space as he stepped to his right and came over the top with a big right hand that pushes Aguirre back and Aguirre is fighting in survival mode at this juncture of the fight. In the fifth, Booth comes forward with a flurry of shots to the head and body but takes step back and boxes the unassured Aguirre. Booth keeping close and getting inside to create more damage lands a hard upper-cut followed by a double hook to the head of Aguirre. At this point Clarence Booth is truly in control. In the final Round with Booth trying to finish off Aguirre, who tries to produce a fight back campaign, is bending too low and gets nailed with straight lefts and right hooks to the head. Clarence “The Truth” Booth races to the finish line. Welterweight Tony Morris goes to (2-0, 2KO) with a TKO victory as Jose Sanchez (0-2) quit in the corner at the end of the second round. Cruiserweight Dan Bolden (1-1) took his time and annihilated Carlton Hammonds (0-1) in four rounds. Nevertheless Hammonds did a little better in the fourth round with a nice jab but couldn’t stay in the bout, all three judges score 36-40 for Bolden in the unanimous decision victory. Jr. Welterweight Paulie Simpson (1-0) wins his pro-debut against Xavier Lugo (0-6). In his pro-debut Tommy Logan (1-0) walked right through Juan Puerto-Salazar (0-1) with a TKO 1:33 of the second round. Salazar came out swinging for the fences, Logan having nothing of it patiently broke down Salazar early 1st round, Quick access Logan opened the door in round to with a straight right followed by a overhand that floored Se round Salazar who got right back up and was floored for the second time in the round and Referee Dennis DeBon waves off the fight. Cruiserweights Travis Reeves (2-1) defeats Micheal Bissett (3-3, 3KO’s) in unanimous decision. Reeves started to box early giving Bissett trouble, Bissett was picking his shots but not creating enough space allowing Reeves to come right in with nice hooks to the head, very tough fight at this point for Bissett. All three judges score the bout 40-35 for Reeves UD. Middleweights Moises Carasquillo (3-0,3 KO’S) broke down Darrell Eacholes at 1:37 of the fourth round by TKO. Carasqillo started slow giving Eacholes opportunities in round one to land more punches and come right at Carasqillo. Both fighters exchanged in the center but Carasqillo turned it up by touching the body of Eacholes and following up by some accurate hooks to his face not giving Eacholes breathing room to land anything solid. Carasqillo turned it up in the right by landing strength rights to the face of Eacholes breaking him down in the later round. VIDAL TAKING A BEATING TO ISSUE ONE FOR THE WBO.